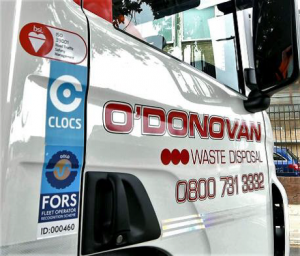 Based in North London with 160 employees, family-run O’Donovan Waste Disposal is a leading waste management company specialising in safe, green and sustainable waste operations across London. O’Donovan is passionate about the waste industry and the company champions a range of ongoing initiatives which demonstrate top-down commitment and as such is widely regarded within the construction, waste and logistics industry as a champion for health and safety, training and environmental excellence. The company is a Fleet Operator Recognition Scheme (FORS) Gold operator (held for over seven consecutive years). 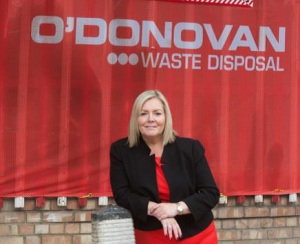 Managing Director, Jacqueline O’Donovan discusses the importance of FORS to the award-winning business. We came across FORS in 2009 when we spotted the stickers on lorries and have not looked back since. We recognised that the resources made available to us would really help us to drive our business forward and improve our operations as well as helping us to introduce a comprehensive training and development plan for our drivers. We passed our initial Bronze Audit and that really helped us to focus on our operational procedures and working practices. From there on we were really encouraged to keep going through the levels and it has paid dividends along the way in terms of our safety and people development. As we progressed through the steps of going from Bronze to Silver and Gold, we really made the most of the member benefits that were available to us and all our drivers availed of the driver CPC training. We also put a number of managers through the practitioner workshops which has helped keep our focus on the investment and management of our fleet including improved fuel consumption and improved efficiency whilst ensuring our continued commitment to best practice and driver development. FORS online training and workshops have been an invaluable source of knowledge for us and we have benefitted hugely from not only our drivers increase in knowledge and safer working practices, but from the knock-on effect that has had in terms of improved fuel efficiency and reduced emissions and penalty charges. We have also made the fully funded Safe Urban Driving training course a compulsory part of our driver’s development plans. This course has helped them understand the challenges faced by cyclists when in close proximity to lorries which has in turn made drivers more aware and vigilant as they navigate London’s roads on a daily basis. Our FORS path since our initial Bronze accreditation has been an invaluable experience as we realised early on the benefits that progressing through the stages would have a huge impact on our business in terms of improved safety and fleet standards, driver knowledge and performance management. FORS has helped us to plan and set our goals and given us the template to measure our operations and exceed our own expectations. Performance Data – adopting the FOR Standards our performance data continues to improve year on year. The table below shows how between two recent years we have managed to improve Miles per Gallon (MPG), NOx and CO2 outputs significantly. This has been achieved through a variety of methods including driver training and modernisation of the fleet. Driver health and fitness reviews have helped us keep focussed on the health and wellbeing of our drivers. We utilise Occupational Health Service Providers to complement our own in-house measures. This enables us to fully understand a driver’s medical status when they join the Company and throughout their employment with us thereby reducing the risk of incidents occurring due to health problems. Our primary strategy for recruiting drivers is to work collaboratively with schools and colleges to attract young and new talent into the industry by extolling the benefits of a career in driving. In terms of noise we have pioneered new covers for the chains that are used on our skip lorries to load and unload skips. This has reduced the noise from this operation tremendously. The Company has recently invested in a 100% electric vehicle as we take our first step to transitioning more of our fleet to electric or gas as vehicles and infrastructure become available. Our future plans include our commitment to continued fleet improvements as we transition to procuring more direct vision lorries. The professionalisation of our lorry drivers remains a key focus as we ensure their continuous training and development to operate at the highest standards whilst keeping the safety of all road users a clear priority. Achieving and maintaining our Gold standard for seven consecutive years is of huge importance to us as a business and is a something we are immensely proud of. The benefits have been numerous and have included our team improving their knowledge, substantial reductions in our insurance premiums due to our safety records and also improved performance management and significantly reduced impact on the environmental through lower emissions and better fuel efficiency.